Grandeco Art Nouveau Damask Glitter Wallpaper in Gold is specially designed to add a touch of elegance to your home this season. 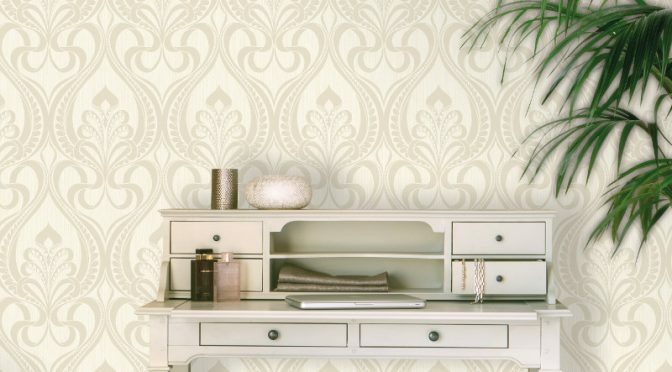 To start with, this delightful wallpaper has a timeless damask design and is sure to make a welcome addition to any home. In addition, the blown vinyl wallpaper offers a textured finish whilst glitter accents add a new dimension to the design. In addition, the stunning combination of cream and gold add a touch of warmth and a hint of glamour. Finally, Grandeco Art Nouveau Damask Glitter Wallpaper in Gold is perfect for use throughout a room. Combine with golden toned home furnishings and accessories to complete the look.